Astrologers usually define a transit as the passage of a planet or celestial body relative to the location of another celestial body or sector in an astrological chart. 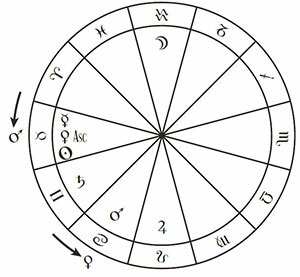 Transits are most commonly discussed within the context of natal astrology. Within this context, “transits” involve the study of where the planets are at some point in time relative to where they were in the natal chart. The natal chart is seen as a static snapshot of a specific point in time, depicting exactly where the planets were when a person was born, whereas a “transit” involves the study of where the planets will be in the future. We will use the birth chart of the filmmaker George Lucas as an example. On June 12, 1962 Lucas was involved in a major car crash which almost resulted in his death. 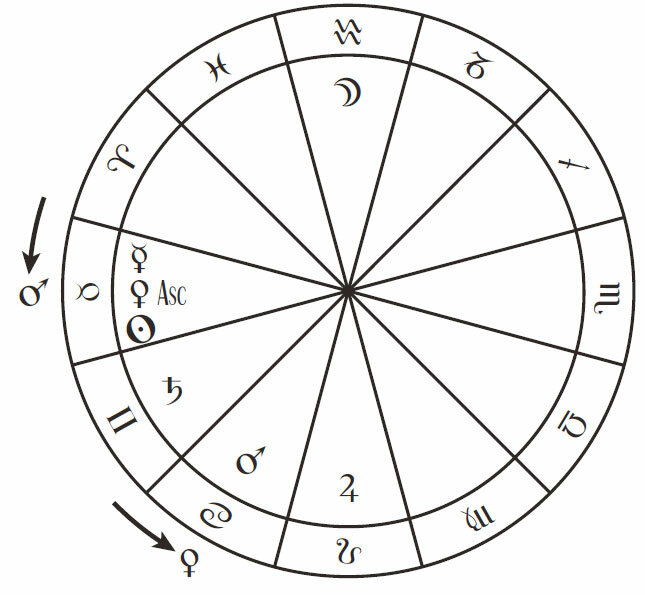 At the time of the crash the planet Mars was at 11 degrees of Taurus, which is the same degree which the planet Venus occupied at the moment of Lucas’ birth. Thus, astrologers say that “transiting” Mars was conjunct Lucas’ “natal” Venus placement at the time, and this in part reflected the nature of the events which occurred in his life that day. Additionally, at the time of the crash transiting Venus was at 25 Cancer, which is the same degree that Mars was in at the time of Lucas’ birth. Thus transiting Venus was conjunct Lucas’ natal Mars placement that day as well. These are examples of exact planetary transits that line up with a specific day and event, although the term transit can also be used more generally simply to refer to the analysis of planets moving through any sector of a chart, as distinct from the fixed natal placements on the day of birth. 1) As the transit of one celestial body across the face of another body from the perspective of an observer here on Earth. For example, the “transit” of Venus across the face of the Sun which took place on June 5, 2012. 2) Some Egyptologists use the term “transit” to refer to the culmination of the Egyptian decans, which is one of the ways that the decans were used for calendrical and timekeeping purposes in ancient Egypt.